Take photos from the top of the tower of this ancient Olomouc church inside of which is a colossal pipe organ. There has been a St. Moritz Church in Olomouc since at least 1257. This is the city’s original parish church, although the current building is from the 14th century. It is a mix of architectural styles, including Gothic, neo-Gothic, Renaissance and Baroque. The church has not come through the centuries blemish free and has undergone numerous renovations and extensions. Among them was the addition of a Renaissance burial chapel in 1572 and a new Baroque-style interior following a fire in 1709. Look over the church’s façade, said to be one of the most significant examples of late Gothic architecture in Monrovia. The main features are the asymmetrical pair of bell towers. The tallest of these is the oldest part of the building, dating back to the 14th-century construction. Inside the church, there is lots of detail to capture your attention. Study the replica of a late Gothic sculpture of Christ on the Mount of Olives. The original figure, which is believed to have been created in the 1430s, was once a feature of the church. It is now on display in the Olomouc Archdiocesan Museum. Sit in the Baroque church pews for a moment of quiet contemplation and visit the altar of St. John of Nepomuk, which holds the remains of the saint. View the church’s impressive organ. The musical instrument has a staggering 10,400 pipes and 135 registers. If you are in Olomouc during September, attend an organ recital, part of the International Organ Festival. Conclude your visit by paying the fee to ascend the spiral staircases of the 151-feet (46-meter) Svatomořická Tower. Views from the observation platform extend across the whole city. St. Moritz Church is situated just north of Upper Square. To get here, take the tram to the Koruna stop. If you are driving, there are lots where you can park for a fee. The tower is open daily from May to September, and outside these months when the weather is favorable. Wait for this quirky communist-era clock to strike noon so you can watch mechanical worker figures emerge from the timepiece and move with music. Rising high above Olomouc’s central square is a lavish 18th-century Baroque monument decorated with religious sculptures that are beautifully illuminated at night. Located in the heart of Olomouc, this spa hotel is within a 10-minute walk of Upper Square, Holy Trinity Column, and Neptune Fountain. Olomouc Town Hall and Astronomical Clock are also within 10 minutes. 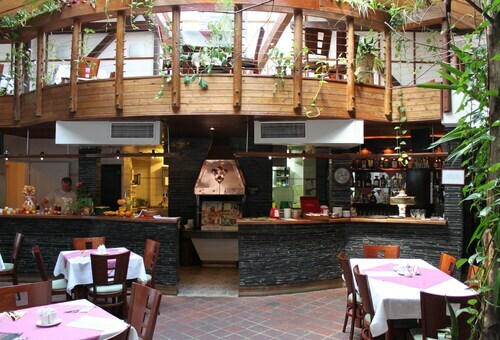 Located in the heart of Olomouc, this hotel is steps from Upper Square and Holy Trinity Column. Astronomical Clock is 0.2 mi (0.3 km) away. Olomouc Hlavni Station is 26 minutes by foot. 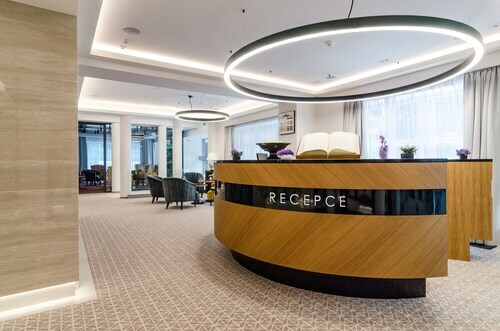 Located in the heart of Olomouc, this spa pension is within a 5-minute walk of St. Michael's Church, Astronomical Clock, and Neptune Fountain. Olomouc Town Hall and Upper Square are also within 5 minutes. Olomouc Hlavni Station is 22 minutes by foot. 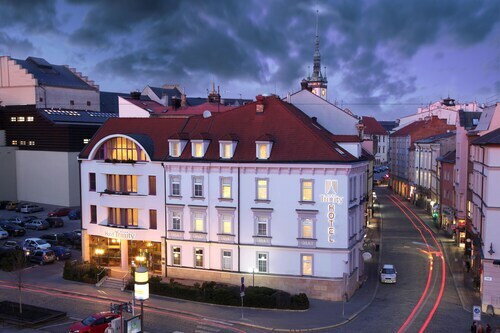 Situated in Olomouc, this luxury hotel is within a 15-minute walk of St. Moritz Church, Holy Trinity Column, and Upper Square. Olomouc Town Hall and Astronomical Clock are also within 15 minutes. 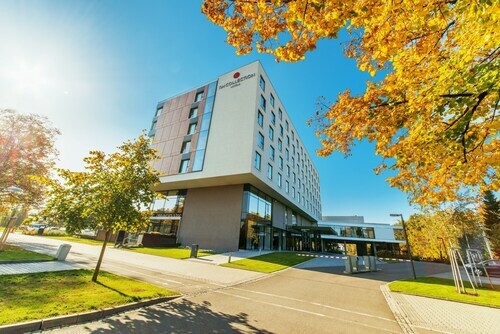 Situated in Olomouc, this hotel is within 1 mi (2 km) of St. Wenceslas Cathedral, Bezrucovy Sady, and Hradisko Monastery. St. Michael's Church and Astronomical Clock are also within 1 mi (2 km). Olomouc Hlavni Station is 9 minutes by foot. 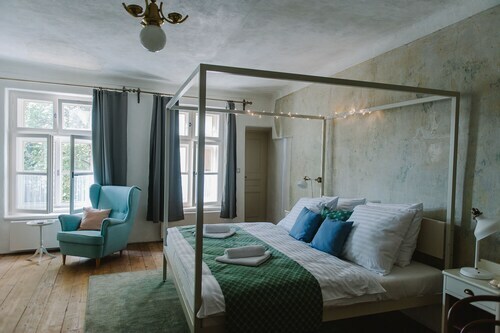 Located in the heart of Olomouc, this historic hotel is within a 5-minute walk of St. Michael's Church, Astronomical Clock, and St. Moritz Church. Olomouc Town Hall and Holy Trinity Column are also within 10 minutes. Olomouc Hlavni Station is 20 minutes by foot. 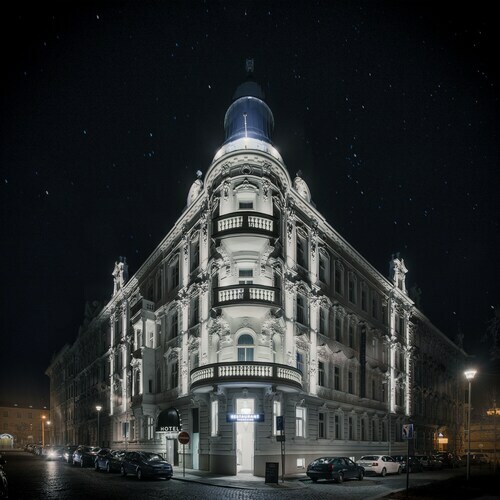 Located in the heart of Olomouc, this hotel is within a 15-minute walk of Upper Square, Holy Trinity Column, and Neptune Fountain. Olomouc Town Hall and Astronomical Clock are also within 15 minutes. Located in the heart of Olomouc, this hotel is within a 10-minute walk of Neptune Fountain, St. Michael's Church, and Upper Square. Holy Trinity Column and Astronomical Clock are also within 10 minutes. Olomouc Hlavni Station is 26 minutes by foot.